Remington model 700 bolt action rifle chambered in .270 Ackley Improved. 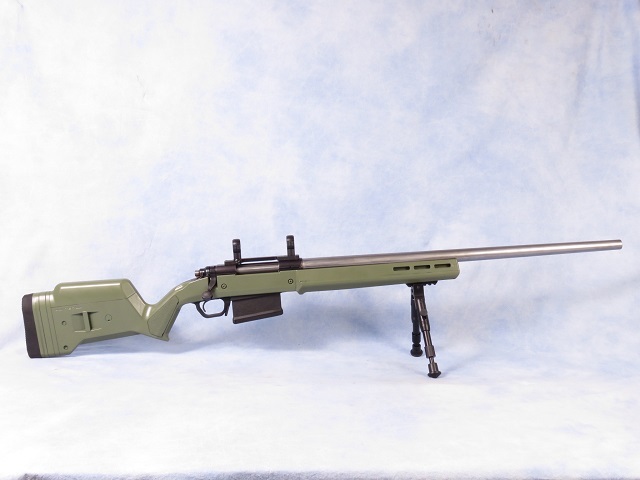 Custom built varmint/target rifle on a Remington 700 action, Timney trigger, Harry McGowen 26" stainless steel bull barrel and MagPul Hunter stock. Comes with bedded original hardwood stock and parts; as well as Redding 40 degree neck reloading dies. Seller is off starting another build - showed us target with cloverleaf accuracy at 150 yards. Condition is excellent. Some clouding on the stainless barrel. Bore is shiny with crisp rifling. Will make you a great target rifle!